If you’re lucky enough to get multiple invites, one of the evening’s traditions is determining which party will be the best. That honor usually goes to the host with the biggest wins and, since IFC had no official party to celebrate its “Boyhood” coup, last night the honor went largely to Fox, with its awards for Searchlight’s “Birdman” (best actor Michael Keaton and screenplay), “The Grand Budapest Hotel” (best motion picture comedy), and FX’s “Fargo” (best miniseries and actor Billy Bob Thornton). Plus, it had Bill Murray on the dance floor; with that, game over. 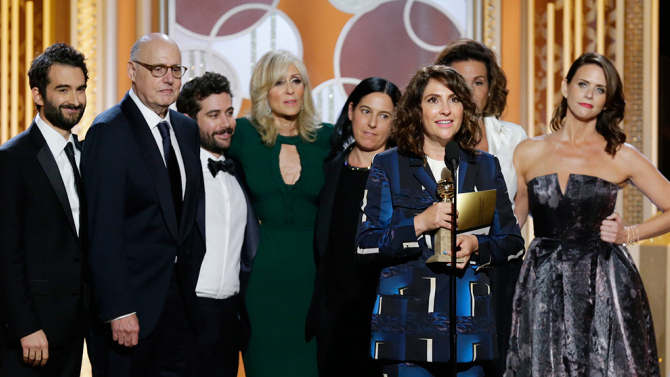 However, the real hero of the night was Amazon Studios, producer of the freshman series “Transparent,” which won best actor for veteran Jeffrey Tambor in his first-ever Golden Globe nomination, and best TV comedy, which was accepted by creator Jill Soloway, who thanked her own “Mapa” in a touching speech. Amazon’s first pilot season was April 2013. “Transparent” beat out “Girls” (HBO) “Jane the Virgin” (CW), “Orange is the New Black” (Netflix), and “Silicon Valley” (Showtime). It’s a hell of a coup for Roy Price and the Amazon Studios team; maybe they’ll consider more of a Globes presence for 2016. And maybe they won’t. Because no matter how many award-winning series Amazon Studios may go on to create, Amazon is different than every other producer in film and television history. Amazon is not a content-first company; Amazon is a technology-first company. However, the question isn’t whether Amazon will change the industry (already has), or the industry will change Amazon (not so much). Amazon’s win represents how the creative and business models for film and TV are thoroughly, and permanently, overthrown. The Golden Globes recognize excellence in film and television, but as we move through the 21st century that taxonomy seems increasingly random; it only describes two available delivery formats. And while Sundance has not embraced episodic content to the same degree as some of its brethren (see: SXSW), they will premiere Andrew Jarecki and Marc Smeling’s HBO nonfiction series “Jinx” as well as the pilot to another Mark Duplass project, the animated series “Animals” (and an acquisition title). At the TWC/Netflix party, “Maps to the Stars” producer Martin Katz discussed his eagerness to work again with David Cronenberg (Katz also produced “Spider,” “Cosmopolis,” and “A Dangerous Method”). However, Katz came from the internet — he was employee no. 3 at MSN Canada — and he’d like to get Cronenberg to create his own episodic series. He said Cronenberg’s been distracted by another medium — he published his first novel, “Consumed,” in September — but he’s warming to the idea. It’s easy to forget that the peripatetic filmmaker is 72 — old enough to remember a time when, if a filmmaker made moving pictures that couldn’t be defined as a movie, he was a failure. Of course, the Globes know quite a bit about what it means to be defined as an also-ran. However, by honoring film and television, and being quick to allow series from non-network outlets to compete, they are positioned to be the awards show that reflects the times they’re in. Meanwhile, the Academy Awards remain the most respected film prize in the world — but it’s also notoriously hidebound by rules and regulations that currently make it impossible to imagine how it would represent the content convergence. On one level, it’s unlikely the Oscars are losing sleep over this; their ratings are roughly double the Globes’, and last year’s Oscars had the strongest ratings in a decade. At the same time, we live in a world where Oscar frontrunner Alejandro Gonzalez Iñarritu has chosen to make a Starz series with Ed Helms and Hilary Swank as his next project. How long will it be before we question the relevance of those filmmakers who don’t adapt?